1Is there a way for me to “slow down” the balding process? If the hair loss is caught in the very early stages, then laser therapy such a Luce can be used to slow down the thinning/shedding process. It turns the weaker hair follicles back into stronger ones. In addition, medications such as Rogaine and Propecia can also help to reduce or slow down the process. You should also attempt to find out the cause of your hair loss. When your doctor knows if the hair loss is genetic or environmental, the best course of treatment can be determined. 2My hair is thinning. What type of doctor should I see? You should select a doctor who offers a range of hair loss treatments and solutions in order to find the best fit for you. At our facility, we offer both surgical and non-surgical options. If you are experience the early stages of hair loss, a non-surgical treatment such as Laser Cap may be the best option for you. It may be a good idea to speak with your primary care physician for a referral near you, or search the web to find a recommend hair loss specialist in your area. 3Is it possible to change the structure of your hair permanently (such as straight to curly, etc.)? No. Your best bet is to visit with a qualified hair stylist who can chemically treat your hair. 4What does it mean to have a “natural” or “unnatural” hairline? Three things really highlight how natural a hairline appears: placement, grafts, and instrument used. When people have procedures done, the doctor should be careful to create a realistic looking hairline. If the hairline is too low and not recessed at all, it will look unnatural from your original hairline. Second, because of the way hair grows, single hair grafts create the most natural looking hairline. Finally, only trust doctors who use the most modern techniques. Doctors who use the “punch graft” method will create a more unnatural hairline. 5What type of doctor should I use when looking for a hair restoration specialist? Basically, as long as a doctor has a medical degree, he or she is qualified to perform hair transplants and consultations. However, the industry does not have very strict guidelines in the hair transplant industry, so you should check out references and reviews carefully before making a final decision. No doctor can become “Board Certified” in the area of hair transplants, but you should look at the experience and current portfolio of the doctor. Additionally, check out testimonials and other information you can. It never hurts to ask too many questions! 1Is FUE Hair Transplant the best harvesting technique? There is no definitive “best” technique. The “best” harvesting technique is really the one that you feel comfortable having after evaluating the pros and cons of both methods. Both FUE and the strip method will yield excellent results. FUE is a newer method which is not as common as strip. FUE leaves small “dots” at the donor site instead of the longer, linear scar you’d get with the strip method. FUE takes longer than strip and would incur a higher cost; however, Neograft has reduced that time factor substantially in FUE procedures. 2What should I expect 6 months after my hair transplant? Results vary from person to person, but generally speaking, patients experience some growth all the way through 12 months after surgery. Most hair has usually shown through by the 8th or 9th month after surgery, but there may be a little unevenness while the later blooming hair “catches up” to the hair that came through initially. In any case, if you are unsure or have questions about your results after transplant, you should contact your doctor. 3What should I expect a month after FUE? Hair Transplant procedures can be scary in the first few months after the procedure, as you anxiously await your results. Typically, at the one month mark, the transplanted hairs are in a “resting” phase. During this time, you will not see any new growth, unless you are also using a form of laser technology, such as Capillus 272. You will see new hair growth at around months 3 and 4 all the way up to a year after FUE. If you are nervous, contact your doctor. He or she will be more than happy to meet with you, assess your growth, and reduce your anxiety about new growth. 4How does smoking affect the results of my hair transplant? Your doctor should go over this carefully before your transplant. The nicotine from cigarettes contracts blood vessel walls, decreases blood flow, and limits the distribution of oxygen in your body. Without the proper blood flow and oxygen, the transplanted hair and grafts have a greatly reduced chance of survival. Each time you smoke, the chance is reduced exponentially, so if you are not able to quit, it may be advisable to seek other options for your hair growth needs, as a transplant would be a waste of time and money. However, if you have already had a transplant and slipped up once or twice, contact your doctor and do not use any more nicotine. You will not be able to tell if permanent damage was done until a year after the procedure. 5Who is qualified to perform hair transplants and FUEs? Many specialists are qualified to perform transplants and FUEs. These specialists are usually M.D.s, D.O.s, or another typical of licensed physician. However, if you have a recommendation of a non-physician, such as an oral pathologist, who you feel confident in, then there is no reason why they cannot perform the surgical procedures. 6Why do doctors recommend using Finasteride or Propecia after a hair transplant or FUE? Lasers and/or Propecia are used commonly after a hair transplant because they will help to slow down other hair loss besides what has been transplanted. Lasers are also helpful with speeding up the regrowth process on the transplanted hairs. 7My skin has been cobblestoned (goosebump-like appearance) from a hair transplant. What kind of laser should I use? You want to wait at least 8 months to give your new hair time to mature. If you treat this area with laser before it is matured, the transplanted hair may be damaged. It’s best to wait a year after your procedure before moving forward with any type of laser treatment on a transplanted area. 8Do I have to wait to go out in public for a few weeks after hair transplant surgery? No. Immediately following the transplant, you’ll notice that your scalp is pink and slightly scabby, but these heal extremely quickly. You’re scalp will look normal again in 8-10 days. If you still had some hair, it will be a lot easier to camouflage the work and you can go out again as soon as you are ready. Physically, you’ll feel fine in a day or two, but limit your physical activity for about 8-10 days. 9Should I opt for a follicular unit extraction or strip for a hair transplant? Both the FUE and strip methods will give excellent results. You should make a choice based on your budget and personal preference. The strip method is the most common method and has been around much longer than FUE. With strip, you are able to move more hair each procedure, so the cost is lower. It does leave a linear scar which is easily disguisable. FUE, on the other hand, leaves small dots instead of a longer scar. Again, these are rarely visible. FUE does take a little longer and has a higher cost. If you opt for the Neograft, the time is reduced a bit. 10My hair transplant didn’t work! Why? It is extremely unusual for a hair transplant procedure, either FUE or strip, to be unsuccessful. Most reputable clinics offer some type of guarantee of growth, so if you clinic did, you should definitely go back and see them. Medication or other side effects are very unlikely to be a cause of hair transplantation not giving growth within 3-6 months. It is important that you follow all care guidelines following the procedure, including eliminating nicotine use and being careful about what touches the transplant area. 11Am I a good candidate for a hair transplant? Good candidates for hair transplants must be identified on a case by case basis. The hair follicles must be examined carefully to determine the cause of hair loss or thinning. Typically, females are not good candidates due to the diffusion of thinning hair around the head, but can experience much success with Luce or laser treatments. 12Why aren’t women good candidates for hair transplants? A very small portion of women are good candidates for hair transplants. Most women with thinning hair have “diffused thinning.” This means that the hair is thin all over the scalp. Therefore, if we removed hair from a different area, such as the back of the head, and transplanted it, it would be thinner hair that would eventually fall out later. Women who are good candidates for hair transplants have a condition similar to male pattern baldness, where the hair is thinning on top, but remains thick on other areas of the head. These women are usually better candidates for a head transplant. The thing to remember is that is you want a hair transplant, you want to transplant good, strong hair. If most of your hair is thin and weak, then you don’t want to spend the money moving it around if it will fall out in a few years anyway. Laser and Luce therapy are very popular treatments for women with diffused thinning. 13How much does a hair transplant cost? With any type of cosmetic surgery, clinics that charge very little compared to others typically have results that look less than professional. It is extremely important to research all of your options carefully before arriving at a decision. You can expect to pay anywhere from 3-15 dollars per graft. Some clinics will charge per hair, whereas other will charge per session. Although you should not automatically assume that they more expensive a procedure is, the better it is, you must take into account that paying more money allows the clinic to take the time and staff necessary to ensure all of the little details that add up to a believable looking transplant are done correctly, such as cutting grafts using stereo microscopes. It will also make the difference between a natural looking hairline versus one that is obviously surgically altered. Although cost is important and you should be careful to stay within you budget, it is important to research carefully. You have a limited number of donor hairs, so you should ensure that a qualified, reputable clinic will be the one moving them. If you are not quite yet ready to take that toll on your wallet, opt for laser treatments until you are ready and comfortable taking the plunge. 14I just had a hair transplant. When can I hit the gym? You need to wait at least 8-10 days, or until your staples or sutures have been removed. Increased activity increases the risk of your scar being more pronounced. Normal walking is fine and will not be problematic. 15What are the side effects of getting a hair transplant? Hair transplants are very safe and have minimal side effects. After the transplant, you may see some hair loss or shedding from the back or side of your head (where the hair was removed). Some of the weaker hairs on your head may also fall out as well. Many clinics will recommend Luce or laser treatments on the donor site to reduce the chance of hair loss after surgery. 1I am in the early stages of male pattern baldness. What treatments should I begin? Early hair loss prevention methods have come a long way in the past two decades. Laser technology is one of the most common and painless options to treat pattern baldness in the early stages. Look into the Capillus 272 or Laser Cap technologies for the best results. They are prescribed and purchased through a physician, can be used from the comfort of your own home, and are just as effective as laser clinical units you see in doctors’ offices. After only a few months of consistent use with laser technology, you’ll notice a difference in your volume and a reduction in fallout. 2How can I reduce my hair loss and strengthen the hair I have left? Laser technology, such as the Capillus 272 or the Laser Cap, is some of the best non-surgical ways to reduce hair loss and strengthen remaining hair. They allow flexibility in treatment and eliminate the need to schedule office visits for treatment as they provide personal treatment capabilities. In addition, laser treatment technology has no side effects and produces the best results of all non-surgical treatment methods. The Hairmax is a specialized laser treatment that is used as a comb. Although lasers can be very effective, you should consult your physician before beginning any type of treatment. A doctor with specialized knowledge of hair loss will look first for “miniaturized follicles.” What lasers do is take the miniaturized follicles and stimulate them back to stronger, growing hair. It is important to consult with your doctor first, as low level laser therapy (LLLT) ranges in effectiveness depending on your specific case. 4Is the Revage 670 Laser effective? Although many were initially skeptical of laser technology to stimulate hair growth, it has proven to be a grossly effective method that yields great results. The Luce device is very effective both used alone and when used in combination with Rogaine. 1I am a woman with thinning hair. Women’s Rogaine has not given me any results. What else can I do? 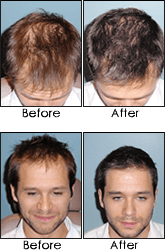 Rogaine is not effective in isolation as it is combined with laser treatment, such as Luce. Studies have found that this combination produces better results after about four months of use than when using only a treatment such as Rogaine. Lasers will yield noticeable results in just a few months. As more doctors are turning to the benefits of lasers with regard to hair loss, check with your primary care physician for a good recommendation. 2If I am a female and I don’t have any hair loss, can I still be a candidate for a hair transplant? Probably not. Very few women are good candidates for hair transplants at all, hair loss or not, due how the hair thins over the scalp of women. Adding incisions to the scalp when there is no hair loss may actually damage follicles that are in good condition, which may increase your hair loss instead of help the situation. If this is something you feel strongly about, however, you should schedule a consultation with your physician to evaluate your current hair state. 3I had a facelift and now I have a bald patch near my hairline. What can be done to fix this? This type of bald spot is increasingly rare. Newer types of lifts use much shorter incisions and rarely result in bald spots. If you have bald spots from an older procedure, micro follicular grafts can be used on the areas that appear bald to you. 4Why aren’t women good candidates for hair transplants? Propecia is best used to stabilize the current state of your hair. It is not effective at re-growing hair. However, the effectiveness of Propecia is largely based on the consistency of its use, so be sure not to delay in refilling your prescription. If you are suffering from thinning or baldness and want to maintain the hair you have, it’s definitely a good option. 2What happens if I stop taking Propecia? The effectiveness of Propecia is largely based on its consistent use, so if you have a gap in taking it, you may experience hair loss or shedding. Typically, a 2 month window is the time it takes for hair loss to begin again after stopping the Propecia. If you adamantly want to stop taking Propecia, consult with your doctor about laser treatments to stabilize your situation, and then begin the process of eliminating the Propecia. 3Can caffeine shampoo be effective in preventing hair loss? There has been no official, substantiated research to support the idea of caffeine shampoo as a preventative measure, nor is there any such shampoo that is FDA approved. There is much more research and support for laser technology, as it has been shown to stimulate blood flow to hair follicles with no side effects. 4Should Minoxidil be used short-term or long-term? Medications, like Minoxidil (Rogaine) and Propecia are effective at preserving remaining hair, but they are long—term treatments. That is, medications used to stop hair loss must be taken indefinitely. If the mediation is stopped for an extended period of time, then any hair that you would have lost will probably fall out when you suspend the medication. Basically, you will need to use it long-term, twice daily in order to benefit from the treatment without wasting your time and money. 1I am a very young male (18) with male pattern baldness. Should my treatments differ from more traditional cases? The treatment itself will not differ from typical cases. The best case for you would probably be a medication such as Propecia, paired with laser technology, such as Luce. Laser technology is beneficial at stimulating hair follicles with no side effects, as it increases blood flow directly to the follicle. 2What is the best treatment for a young male with telogen effluvium? The best first step would be a genetic test, such as Hair DX. This will help to determine if the cause of your hair loss is genetic or environmental. If the test determines that you are at risk for hair loss, then it’s time to work with your doctor on best treatment methods.